MISSOULA — Vivian Faye Parker arrived on Aug. 28, 1931, in Weedpatch (her mother would say “in a weedpatch”), California. Born to Mabel Estella (Stonehocker) and Frank Guy Parker, she joined older sister Eileen in the cotton fields south of Bakersfield, where scarce depression era jobs had lured the family from Montana. In 1934, a toe-hold on 80-acres near the Stonehocker family in Round Butte afforded an opportunity to return to the state Vivian would reside in the rest of her days. Brother Frank Glen completed the family in 1936. 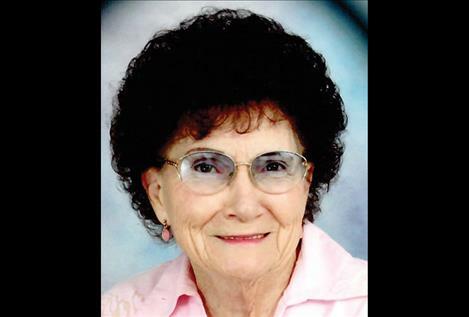 Educated in the Round Butte rural school and graduating as Valedictorian of Ronan High School in 1949, she snubbed college to marry farm boy Arthur Aylesworth five days after her 18th birthday. They set their shoulders to building a new home, a family, and a life on the Aylesworth dairy farm. First born, Dan Arthur, arrived in January 1951, followed by Ray Lawrence in 1953 and Kent Morgan in 1957. To their delight, a girl, Lynnette Claire, completed the family in 1960. In that same year the dairy was sold, and the farm transitioned to raising certified seed crops and feeder cattle, with the built-in farm crew of boys. Vivian’s life changed again in 1964, when Art was injured in a farm accident, forcing upon him a career change to the insurance industry. The farm-work ethic lent itself well to this new challenge and Art’s success propelled them to travel opportunities around the world. Vivian often remarked she never dreamed that she would have such experiences. She made the most of every destination by reading the country’s classic literature, studying travelogues and history in preparation, then keeping journals along the way. Back home, she supported and loved her grandchildren as they arrived: first twins Mackenzie and Joshua in 1979, then Daniel in 1995, and finally Michelle in 1997. Supporting Art in his varied interests led to meeting new friends in many areas. Particularly, Art and a group of friends began a labor of love for conservation and restoration of the Mountain Bluebird populations throughout the northern Rocky Mountain states and Canadian provinces. The non-profit Mountain Bluebird Trails, Inc. continued this work, with Vivian involved as a guiding star. Another favorite activity emerged from a partnership with friends Arnie and Lucella Armstrong, developing a four-season cabin on property along the Clark Fork near St. Regis. This became a refuge for Vivian and Art for long weekends. In 1999 Vivian became a widow with Art’s untimely death. Due to an extraordinary circle of friends and colleagues, she was not alone. With their support and love, she continued to move forward with her life. Vivian was a lifelong learner, loved to read and participated in her book club. She kept up her flower beds with hand labor and a discerning eye, Also, she kept the travel bug fed, with a little more adventurous spirit, perhaps. Prior to a trip to St. Petersburg, she read “War and Peace” for the second time. Vivian was a past Worthy Matron of Order of Eastern Star. She was proud to be part of a new PEO chapter, volunteered at the food bank and treasured her friends, old and new. Vivian was predeceased by her parents; her son, Kent; her beloved Art; her sister, Eileen, and her husband, Roy D. Waugh. She is survived by her brother, Frank Glen Parker and wife Jill of Lehi, Utah; her children: Dan and wife Sue of Kalispell, Ray and wife Celie of Ronan; and Lynne and husband Jon Conn of Post Falls, Idaho; grandchildren: Mackenzie of Seattle, Washington; Josh and wife Amy of Castle Rock, Colorado, Daniel of Lewistown, Michelle Conn of Lewiston, Idaho; and her treasured great-grandchildren: Benjamin, Grace and Addison of Castle Rock. As Vivian did not care for the winter months, a memorial service will be held on May 4, 2019, at the Pablo Christian Church at noon. In lieu of flowers, memorials may be made to the Mountain Bluebird Trails, Inc.; St. Luke Hospital Foundation or the PEO chapter of your choice.